In the aftermath of the inspiring popular uprising in Argentina at the end of 2001 and the battles that blocked neoliberalism in Bolivia from 2003-2005, the Left came to power in governments across South America—most notably in Argentina, Venezuela, Brazil, and Bolivia—in a series of electoral upsets that were quickly hailed as revolutions. In hindsight, these victories prove to be less than convincing. The new revolutionary governments institutionalized social movements, turning them into mere appendages, they continued cutting down the rainforests and displacing indigenous peoples in the name of progress, they supported free trade agreements, used paramilitary or police forces against student demonstrators, expanded the exploitation of gas, oil, and coal, and imprisoned dissidents. Business as usual. Wallmapu was not conquered until the 1880s—around the same time the US government was exterminating the last of the Great Plains warriors who had refused to accept life in the concentration camps. In a surprise attack, the states of Chile and Argentina invaded and divided up the Mapuche territories. The Mapuche made up a large part of the socialist guerrilla groups that fought against the dictatorship and the stage-managed transition to democracy, but many came to feel that the socialists were just using them, that they too ascribed to a Western notion of progress which relegated the Mapuche to history’s dustbin. In the ’90s they began marking out a separate path for their struggle, and in the ’00s that struggle began to take on the form we see today: direct action to recover their land. 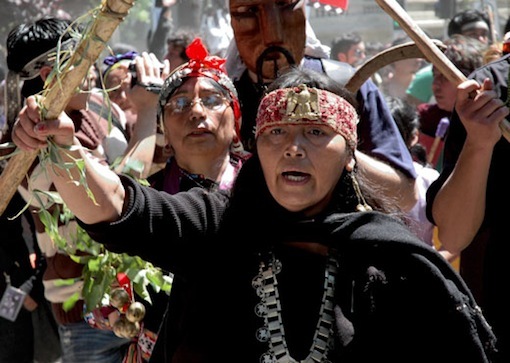 The Mapuche struggle, like any other, is heterogeneous. It also has its NGOs, political parties, and cautious reformers. But the common view is that the Mapuche struggle is taking place in the rural communities, and what’s happening in the countryside looks nothing like politics as usual. Land, in the Mapuche struggle, is a transcendent concept. It is not simply a plot of terra firma demarcated by a set of boundaries, as it is in the liberal Enlightenment thinking that constitutes the earth-hating religion of the West. Land is a living, inalienable thing that serves as the basis for the community’s existence. Land, within this logic, is not just a single item from a list of humanitarian issues, placed somewhere below “human rights” and above, say, “reproductive health.” It is everything. It is the hub that connects to every other aspect of existence. Human rights, in contrast, is an empty concept that has been used to strip alienated individuals of every last resource they might use to provide themselves a dignified subsistence, in exchange for a pittance of symbolic freedoms and immaterial guarantees. That’s why the Mapuche in struggle are not demanding anything, they are taking it. Police surveillance and harassment are a constant reality in Mapuche communities. In 2008 police shot Mapuche teenager Matias Catrileo in the back with an uzi during a protest. In 2009, they killed another active community member, Jaime Mendoza Collio. On August 6 of this year, Rodrigo Melinao Licán was found dead in a ditch from multiple bullet wounds. Eight days later, another Mapuche community member was gravely injured after a run-in with a landowner. Just this past October 14, the representative of a logging company ran over a community leader from Newen Mapu, in the Alto Bío Bío region. When trigger-happy police shot one of their own in a violent raid on the community of Wente Winkul Mapu in April, 2012, they needed a scapegoat, so they arrested one especially active community member, Daniel Melinao, when he was on his way to give a talk about police repression in Mapuche communities at the university in Concepción. On October 10, police invaded again. This time, they brutally arrested several community members, including a minor, and beat and tortured them at the police station. They bulldozed people’s houses, killed livestock, destroyed fences and irrigation works, terrorized children, stole more tools—tools the people rely on for their daily subsistence and can scarcely afford to replace—and to top it off, they bulldozed a wider path into the village to make it easier for them to come in next time. But Chile, desperate to project the image of a country governed by due process, can repress the Mapuche with a combination of old-fashioned brutality out of the public eye, and a constant barrage of charges designed to exhaust and impoverish any community that takes a stand. Even with a relative absence of convictions on false charges, the effect is to discourage other communities from rising up. Such a tactic can only work if the state can also offer a positive incentive. This is where NGOs and charities come in, imposing the logic of progress and development to “help” those who agree not to help themselves. Communities that do not take back their lands get charity projects. Communities that are in the process of taking their lands back do not. Chile is also an international model of reforestation. Logging companies, World Bank statistics, and major environmental NGOs alike proclaim the comforting statistics of millions of acres of “reforested” land. But the people who live there know that a monoculture of invasive trees planted in rows and treated with chemicals is not a forest. And even a national park with a few native species is not a step in the right direction if people are not allowed to practice traditional forms of subsistence within it. Progress, whether in the neoliberal paradigm or the progressive one, still means genocide, alienation, and total colonization. Its implicit violence makes it an offer we can’t refuse. The Chilean state, in its brutal dealings with the Mapuche quest for independence, demonstrates that anything that does not fall in lockstep with Progress will be prosecuted as terrorism.